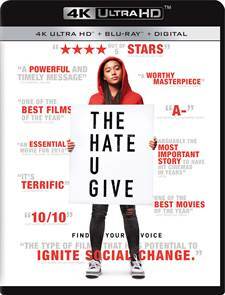 Download The Hate U Give in Digital HD from the iTunes store. Listen to the The Hate U Give soundtrack on Apple Music. The Hate U Give images are © 20th Century Fox. All Rights Reserved. Racial Profiling is defined as the use of race or ethnicity as grounds for suspecting someone of having committed an offense and it is a problem that plagues cities across this country. Recently a number of unarmed young, black men have been killed by police officers who saw them as a threat simply based on the color of their skin. When these injustices go unpunished it stirs up a string of protests that often become violent. It has also sparked the "Black Lives Matter" movement throughout the United States. 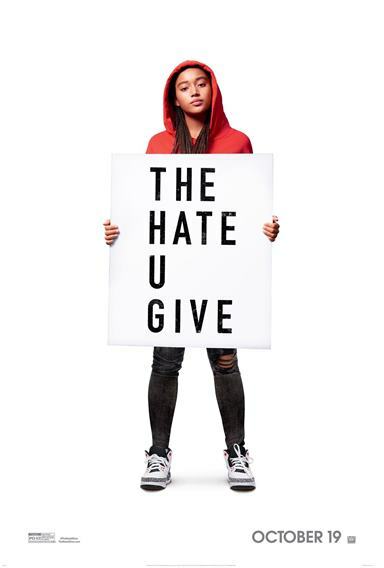 In 2017 author Angie Thomas published a fictional novel based on these ideas called The Hate U Give and in 2018 it became a major motion picture starring Amandla Stenberg (The Darkest Minds). Starr Carter (Stenberg) lives a life of duality. She lives in the ghetto but attends a private school with mostly white, upper-middle-class students. At home, she isn't good enough for her friends and at school, she can't act "ghetto" in order to fit in. She hates it but does it to survive and she deals with it on a daily basis. I don't know if she even realizes how much it affects her. All that changes one night when her friend Khalil (Algee Smith; Detroit) is pulled over while she is in the car. As he pulls a hairbrush out of the car, the police officer imagines a gun and shoots Khalil while Starr watches. Suddenly she finds herself in a fork in the road. Does she speak up for Khalil and her community and make enemies of the drug dealers in town which would put her family in harm's way or does she stay silent and watch as a police officer not face any repercussions for killing an unarmed man? The dilemma changes her and her family and shows what can happen when young people are faced with these types of situations. Stenberg is an incredible young talent who fully immerses herself into the role of Starr. She drives the story and showcases how she traverses these vastly different worlds. She commands your attention every time you see her on screen and always delivers a masterful performance. Regina Hall (Girls Trip) as Starr's mother is excellent as well and Russell Hornsby (Grimm) brings a street smart attitude to the role of Starr's father. Anthony Mackie (Captain America: Civil War) and Common (Selma) also give solid performances as the head of the drug ring who threatens Starr and her police officer uncle respectively. The 4K video quality is excellent and the various sets are shown in great detail, whether it is the crisp and clean hallways of the private high school Starr attends or the rundown houses in her neighborhood of Gardens Park. The DTS-HD Master Audio 7.1 matches the video quality well and shows off the soundtrack and dialogue. The extras are housed on the Blu-ray disc and include Extended scenes, Starting a Conversation, The Talk, Code Switching, The Heart of Georgia, Thank U Georgia, Starr: Shine Your Light, and Audio Commentary. Many of these are interesting and thought-provoking as well as being eye opening. The Hate U Give tackles a difficult but necessary subject matter and does so brilliantly. From The script to the cast to the settings, it gives varying perspectives on a controversial topic and doesn't shy away from uncomfortable conversations including the opening scene where Starr's Father sits with her and her siblings at the table and gives them the "talk" on how to conduct themselves around police officers, especially Caucasian ones. This scene sets the tone for the whole film and delivers on its promise to offer various perspectives while attempting to educate. A well done and worthwhile film that everyone should see.